Many electric cars boast futuristic designs – take a look at the BMW i8 – or at least slightly updated takes on current cars, but the Jaguar E-Type Concept Zero gives us a taste of a classic with 21st century tech under the hood. If you’re a fan of the 1960s/70s Jaguar E-Type, dubbed "the best looking car ever made" by none other than Enzo Ferrari, then the E-Type Zero could well be up your street. Based on the 1968 Series 1.5 Roadster, from first glance it looks like a mint condition vintage Jag, but open it up and you’ll find an all-electric 220kW motor capable of propelling the car from 0-62mph in just 5.5 seconds. It has a mixed usage range of around 270km (165 miles) on a single charge, which isn't as good as the likes of Teslas or Nissan's new Leaf, but Jaguar is restricted by the size of the E-Type's chassis when it comes to squeezing in a battery. A quick look inside the cockpit and the traditional seats and over-sized steering wheel are joined by a modern automatic gearbox and a touchscreen display – ensuring you have 21st century infotainment at your fingertips. With the all-electric E-Type being a concept the chances of it going on sale are slim, but Jaguar is gauging interest and if enough people show willing they will produce the car. 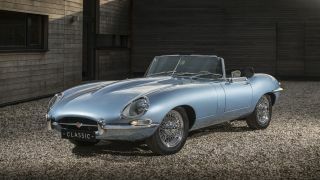 In terms of price it falls under the 'Jaguar Reborn' division which restores classics to mint condition, which means you'll be looking at around £300,000. Alongside the Jaguar E-Zero launch at the firm’s Tech Fest event in London, the British manufacturer also confirmed that all its cars would offer electric power in some capacity from 2020, featuring fully electric, plug-in hybrid and mild hybrid engine options. Jaguar's first fully electric car, the Jaguar I-Pace, goes on sale next year, and will spearhead the firm's push towards the cleaner, greener tech. This follows on from Volvo's commitment for an all-electric range from 2019, and we expect more car makers to follow suit in the coming months as the industry begins to shift about from combustion engines.